You can now use the [pmpro_account] shortcode as a true shortcode: on other pages, in widgets, and more. This update also adds the ability to limit the appearance of the shortcode to specific sections: memberships, profile, invoices, and links. To customize the display, just remove sections from that list. Use it to add column-type styles by nesting with the column classes of your theme. Use it to hide sections entirely, for example the “Links” section if you do not need to allow members to cancel. Use it to display a section then use the membership shortcode between sections to show special stuff to members based on their level. Add a single section to a sidebar or footer widget to pull in specific membership information. Worked like a charm. Very slick! Just a quick question about the use of this shortcode or any other shortcode. I’m still a bit new to codes and stuff. How do I change the text that is generated by this shortcode? So if I for example I’d like to change the word Memberships in My Memberships to Products so it says My Products, how would I do that? removing the ‘links’ attribute does not work. Even after writing the shortcode as [pmpro_account sections='membership,profile,invoices'] the links ‘Renew’ and ‘Cancel’ still show up in ‘My Memberships’. The “links” block is the “Member Links” section that shows up (by default) below the invoices section. If you want to remove the links in the “account” section, open a topic on our member forums and we will help you with this customization. So, to be clear, the “ways to use this feature” bullet point “Use it to hide sections entirely, for example the “Links” section IF YOU DO NOT NEED MEMBERS TO CANCEL” is not actually true. 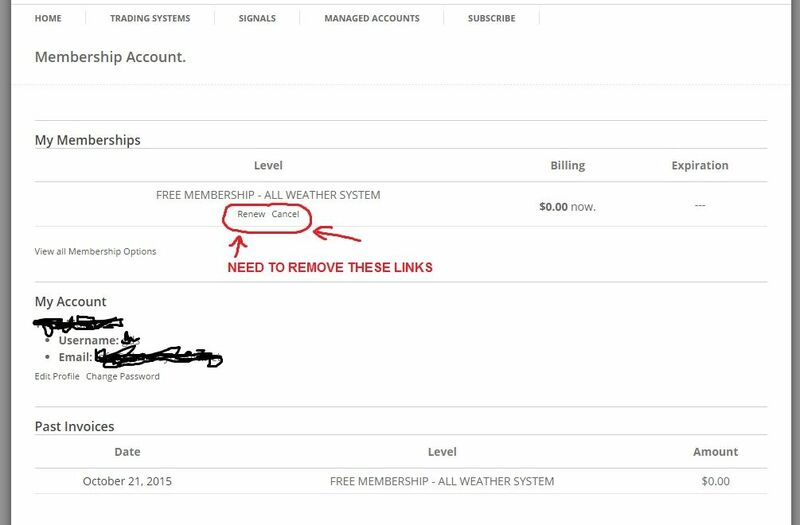 It doesn’t allow you to get rid of the “Cancel” link within the Membership chunk. You can get rid of the whole Membership chunk, though. If you don’t want users to cancel, I suggest editing the cancel page to have a description of your cancellation policy instead of the pmpro_cancel shortcode. Is there a way to remove the “edit profile” button from this page?